16,000 years ago, Pennsylvania was a very different place. However, as you drive along the windy, forested roads of Washington County near the West Virginia border, little has changed in the landscape. It’s in these woods, that have changed so little through the millennia, that the entire history of human migration to the Americas was rewritten. The modern story starts in 1955, when Albert Miller, a local farmer near Avella, Pennsylvania, was walking his land. Under a rock overhang perched high above Cross Creek below, Miller noticed a small object sitting next to a groundhog hole. Realizing its native origin, Miller spent the next 14 years looking for an archeologist to come and conduct a dig. Finally, in 1973 Miller was able to convince archeologist James M. Adovasio to conduct a dig on the site. What Adovasio discovered changed the entire historical understanding of human migration to the Americas. Prior to the discoveries at Meadowcroft, it was widely believed that humans had come across the Bering Land Bridge to North America during the last ice age, roughly 13,000 years ago. However, as Adovasio began to carbon date the campfire residue and deer bones found at the Meadowcroft Rockshelter, he was shocked to discover that he could trace the history of human habitation of the area back 16,000 years; 3,000 years before it was thought humans had first entered the Pacific Northwest of the Americas. The excavated area of Meadowcroft Rockshelter has yielded 20,000 artifacts. 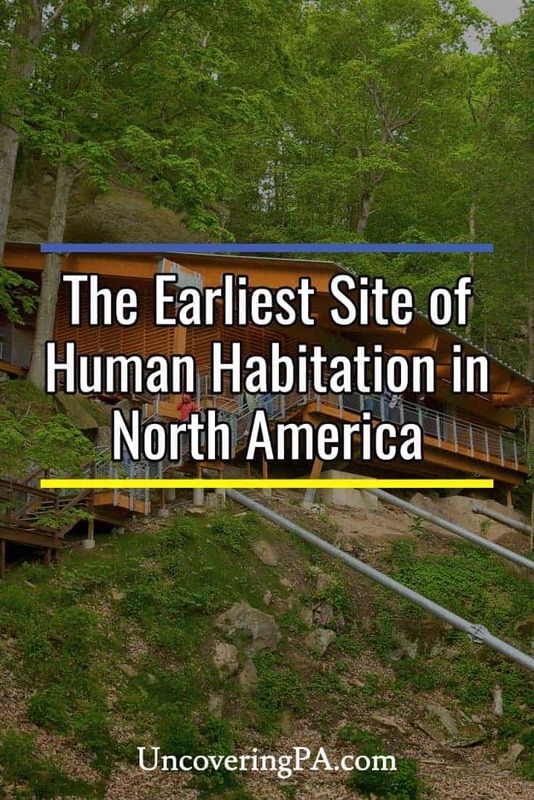 Even more shocking, Meadowcroft Rockshelter showed signs of continual human habitation until the 18th century, making it not only the oldest but also the longest continual spot of human habitation in North America. As you can imagine, the finding was so contrary to the previous narrative that it was widely disregarded when released. However, over the last 40 years, the findings at Meadowcroft have become accepted by the majority of those in the field. Today, Meadowcroft Rockshelter draws thousands of visitors from around the world to this tiny rural corner of Pennsylvania. Until recent years, the short hike up to the rock shelter was precarious at best and was rarely open to the public. 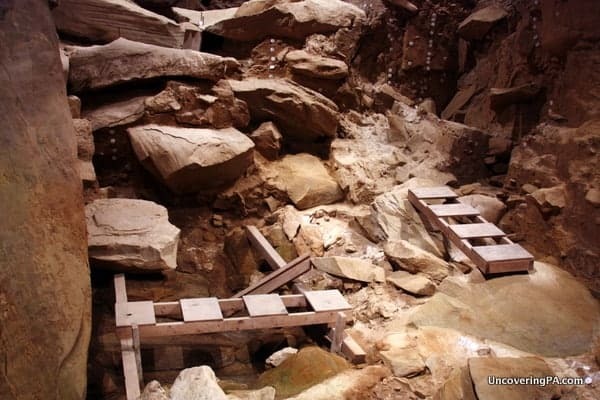 However, in 2008, a staircase and modern building were constructed to make visitation easier and to protect the site from weather and erosion. Climbing the stairs to the rock shelter, I was excited to see such a history-altering place. Unfortunately, I was initially disappointed to see little more than a hole in the ground. In fact, it looked more like a basement under construction than an earth-shaking historical site. Fortunately, though, there is an 18-minute video that explains what there is to see at the rock shelter, complete with automated lights that light up various areas of the dig site. Once things were pointed out to me, my amazement at the site came back. Still visible in the dirt was a 10,000-year-old fire pit, 4,000-year-old deer bones, and rodent holes that were just as old. Digs occur periodically at the site, which has yielded over 20,000 artifacts, including pottery, tools, and baskets. 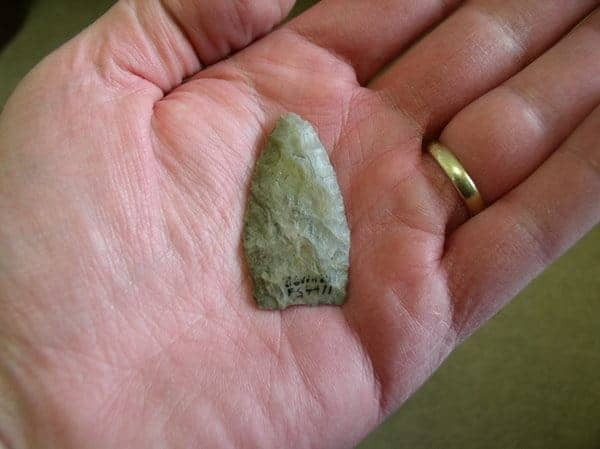 The most important artifact is an arrowhead that dates to over 12,000 years in the past. While the Meadowcroft Rockshelter is the clear highlight of the site, it’s not to the only thing to do on the grounds. In 1969, four years prior to the first archeological dig on the hillside, Albert Miller opened his property to visitors with a reconstructed 19th-century village. Moving several local buildings onto the site, Miller created his village to help visitors understand what life was like in Washington County during the 19th century. Since it was set up, more buildings have been moved into the village such as a schoolhouse, church, blacksmith shop, and several homes. It is also home to one of the 23 historic covered bridges in Washington County. During the summer months, costumed interpreters are present in the village to teach you about the era. Also on the property is a 16th-century Monongahela village. 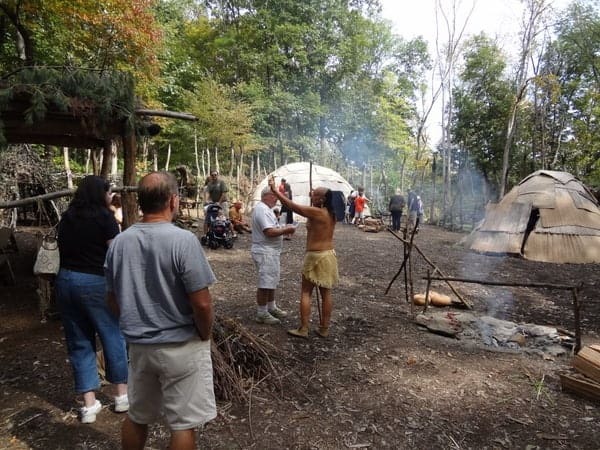 The Monongahela tribe vanished from the region before Europeans arrived, so little has historically been known about the natives that once occupied the region. However, through archeological excavations, they have been able to set up a re-creation of what a village would have looked like. However, as interesting as the villages were, they paled in comparison to the rock shelter itself. 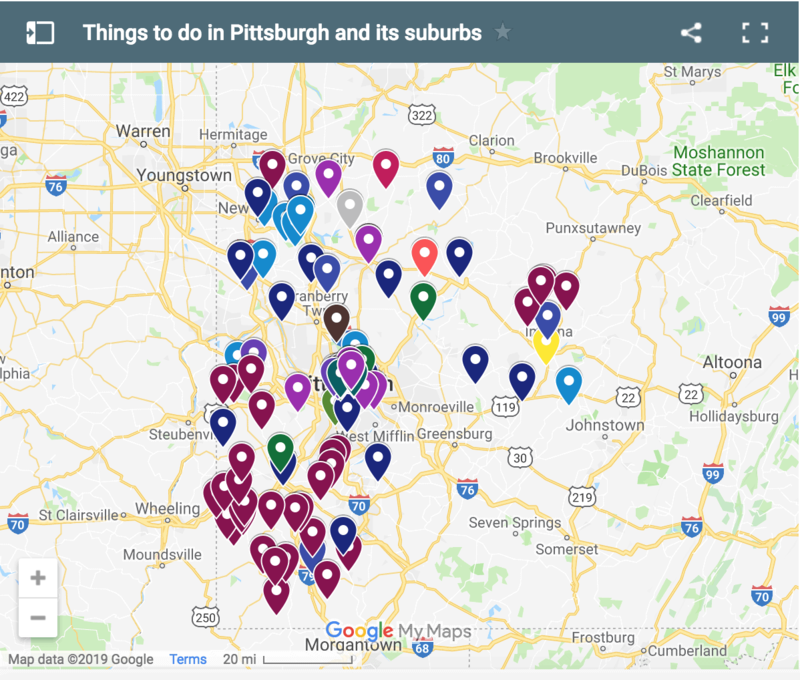 One look at a map will show you that visiting Meadowcroft Rockshelter isn’t very easy. However, for those interested in the history of human migration, Native Americans, or unusual sites, Meadowcroft Rockshelter is a must-visit destination. Note: My visit to Meadowcroft Rockshelter was set up by the Washington County Visitor’s Bureau. However, the opinions expressed in the article are my own and were not subject to review. The photo at the top of the article is used courtesy of Meadowcroft Rockshelter, copyright: Ed Massery. 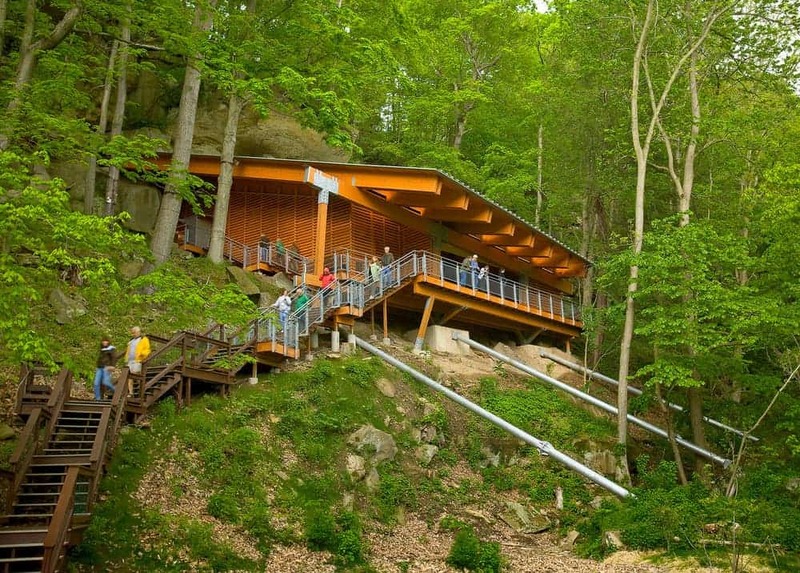 Planning your trip to Meadowcroft Rockshelter? 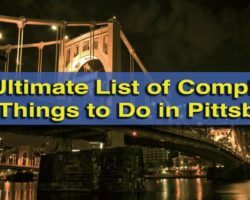 Consider stopping at the Heinz History Center, Pennsylvania Trolley Museum, LeMoyne House, or Raccoon Creek State Park on your way. Thanks for this article, which reminded me of this spot. I saw stories before about Meadowcroft, but really have to put it on the must-see list! Great article, I’ve lived in Western. PA all my life and never knew about this place(Meadowcroft). I will definately be making a visit there this year. Thanks! Good information which provides more areas to enjoy. I am particularly interested in SW PA. Thank you very much for the article, but where are the 20K+ artifacts currently stored? I know not at Meadowcroft – I was there recently – very cool if you follow paleoanthropology, or just for a nice ride in the country side. I have no idea where the artifacts are being stored. I’m sure the site could offer more insight if you contacted them. 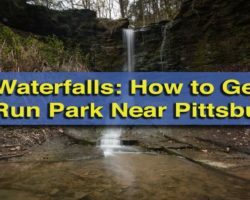 I lived in Washington County for five years and even visited Cross Creek Park and have never heard of this place! It must be a well-guarded secret! Next time I’m in SWPA, I will visit this diamond in the rough. Wish I had known about it sooner. 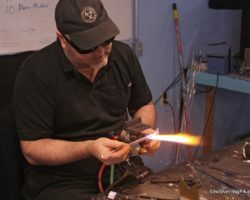 Thanks for a great article! It’s amazing how little known it is given how historic the site is. I was a student at Pitt when Jim Adovasio was doing this groundbreaking work. When I visited the site then it was just a hole in the ground with clear plastic sheets held up by poles. Glad to see the improvements for visitors. I think they keep it low-key to protect the site from scavengers. Adovasio has since moved to a college in Erie, PA. The artifacts are probably at Pitt. Since then, additional digs elsewhere show human habitation in the Americas as far back as 25,000-30,000 years ago. I’m sorry to hear that, Linda. 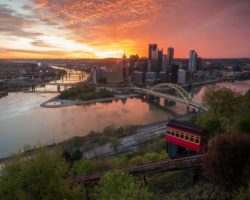 Unfortunately, since the content on UncoveringPA is provided free of charge, there has to be some way to make the money necessary to continue producing it. A small number of ads per page is one of the ways I do it.